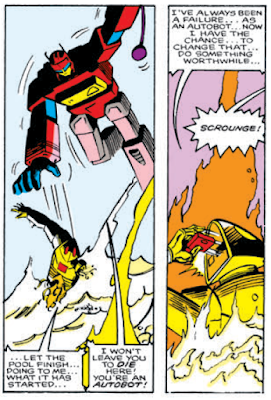 Science's Less Accurate Grandmother: Review: The Transformers Classics, Vol. 2 by Bob Budiansky, Don Perlin, et al. Review: The Transformers Classics, Vol. 2 by Bob Budiansky, Don Perlin, et al. I just realized I've been neglecting to mention my work at USF the past couple weeks, which have seen four of my reviews materialize: The New Counter Measures: Who Killed Toby Kinsella? (Christmastime during the Three-Day Week), Doctor Who: Aquitaine (the Doctor meets a robot butler who can butle with the best of them), The Avengers: The Lost Episodes, Volume 6 (Steed and Keel fight crime in the streets of London, at a shipyard, and at a fun fair), and Doctor Who: The Peterloo Massacre (the Doctor visits North and South, only it really happened). Even within the bounds of what you can or should do with comic books based on a toyline, The Transformers is not and never will be great. There are just too many characters with too little personality to distinguish them from one another, and more are constantly being introduced, meaning you never get to know anyone long enough to care about them. Plus, Bob Budiansky's plots range from bizarre to far-fetched: this volume features a Decepticon plot to steal music from a rock concert, an out-of-work comic book writer hired by the government to pretend to be a terrorist controlling the Autobots and Decepticons, a group of Decepticons who go rogue to leave graffiti on human monuments, and Optimus Prime committing suicide when non-player characters are accidentally killed when he has a videogame duel with Megatron. This isn't great comics; it's not even great hokum. I love the idea that Megatron is so convinced that Optimus is not dead, he kills himself to get one over on Optimus. Terrifying death by acid disintegration, that's what this kid's comic needs. This is definitely a euphemism for something sexual. This volume actually has two very good stories, the other being "Showdown!" After a big Autobot/Decepticon battle, the Autobot Skids is left for dead, stuck in his vehicle mode (a van), where he's found by Charlene, a grocery store cashier who dreams of a better life, and who needs a new car. Charlene has Skids repaired, and, tired of war, Skids decides to lay low and just act as her van. Of course, circumstances force him to reveal himself to her-- but they decide they like the arrangement and become fast friends. It's a story of two different sides. In one sense, it's a cute slice-of-life tale. In another sense, it's the story of a wounded soldier trying to escape an endless war that has caused him nothing but pain and anguish. It's at once adorable and weighty, and it's probably Budiansky's second-best work on the Marvel Transformers title. Next Week: The nadir and the peak of The Transformers, in Classics, Vol. 3!